7/1/2018 It was a six-hour race on a near 100-degree day at Watkins Glen International, but it all came down to an amazing restart by Stephen Simpson in the No. 99 GAINSCO "Red Dragon" ORECA LMP2 car that sealed the Sahlen's Six Hours of The Glen victory for the JDC-Miller Motorsports team in IMSA WeatherTech SportsCar Championship competition Sunday. Simpson restarted the race in third place, behind race leader Jordan Taylor in the No. 10 Konica Minolta Cadillac DPi-V.R and Juan Pablo Montoya in the No. 6 Acura Team Penske ARX-05 DPi. While Taylor led the field through Turn 1, Montoya pulled alongside running uphill through the Esses and neither driver was giving the other an inch. Simpson, meanwhile, had a full head of steam and as the two leaders began to slow for the famed Watkins Glen International "Inner Loop" chicane, he rocketed down the inside of Taylor and blasted past both cars to take the lead. Simpson then managed to build a gap on Montoya, who was able to get past Taylor for second. However, that gap got smaller over the closing few minutes in the race and the race was still very much in doubt as Romain Dumas also joined the fray in the No. 54 CORE autosport ORECA LMP2 car. The top three cars were covered by less than two seconds as Simpson took the white flag, but the South African-born driver who recently became a U.S. citizen was able to keep both cars in his mirrors for the final 3.4 miles to score the victory for himself and co-drivers Misha Goikhberg and Chris Miller. "I don't know who the guy was in the Penske car, but him and (Taylor) slowed each other down enough going up the Esses. I don't know, I might have had some wheels on the grass there, but I wasn't lifting off. After that, I really expected a lot of hard work from the Penske behind me, and after a lap or two, I realized that I had a bit more speed than he did. I wanted to build a gap and make sure that when I got to some GT traffic, I had a bit of a gap. I learned from last year. I'm just so proud of this team." It was the first overall and Prototype class victory for all three drivers and comes after the trio finished second in the Sahlen's Six Hours of The Glen last year. It was third WeatherTech Championship race win for Simpson and Goikhberg. Both previous wins came in the Prototype Challenge (PC) class, the most recent coming in the BUBBA burger Sports Car Grand Prix at Long Beach in 2016. "There's absolutely no words to describe what we all feel," Goikhberg said. "It's been such a long time coming and all the heartbreak we experienced along the way. To finally close the deal, to seal it and to win a race in the top class feels amazing. You don't understand the work that's been put into this, the time, it's really been a long time coming. Hopefully, this will give us a boost and give us more momentum so we can keep having respectable results in the championship." It was Miller's second WeatherTech Championship race win. He previously joined Goikhberg, Simpson and Kenton Koch in winning the PC class in the 2016 Rolex 24 At Daytona. "It's huge," Miller said. "We're such a small team and we've worked so hard for a couple years. Last year, we had two really close calls and you start to wonder how many more opportunities you're going to get. This year, the guys have really stepped it up. We've been pushing so hard. Stephen did an unbelievable last stint. For us, it's a huge moment and hopefully the beginning of even more wins to come." Simpson won the race by 1.954 seconds over Dumas, who passed Montoya in the final turn of the race to score the runner-up result for the No. 54 team and co-drivers Jon Bennett and Colin Braun. It was their second podium result this year following a third-place run in the season-opening Rolex 24 At Daytona, and the team hasn't finished lower than fourth in any of the three Tequila Patrón North American Endurance Cup races this season. Montoya and co-driver Dane Cameron combined to lead a race-high 124 of the 202 laps completed over the six hours. It was their second consecutive third-place result, matching their performance in the Chevrolet Sports Car Classic in Detroit last month. After leading the race at the halfway point, Bruno Senna, Phil Hanson and Paul Di Resta came home fourth in the No. 32 United Autosports Ligier machine to make it three LMP2 cars inside the top four positions. Taylor and Renger van der Zande completed the top five with a fifth-place showing in the No. 10 Cadillac. With a sixth-place result, No. 5 Mustang Sampling Cadillac DPi-V.R driver Filipe Albuquerque now leads Action Express Racing teammates Eric Curran and Felipe Nasr in the No. 31 Whelen Engineering Cadillac by one point, 169-168, in the Prototype point standings. Albuquerque shared the No. 5 on Sunday with Christian Fittipaldi, the team's Patrón Endurance Cup driver in 2018, and Gabby Chaves, who was filling in for the injured Joao Barbosa. Curran, Nasr and endurance driver Mike Conway finished seventh in the No. 31. 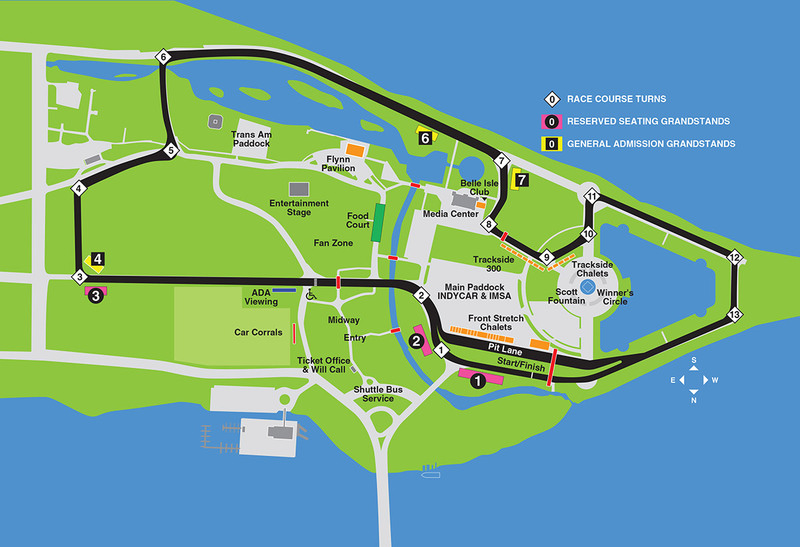 Next up for the WeatherTech Championship is the series' lone trip north of the border to Canadian Tire Motorsport Park for the Mobil 1 Sports Car Grand Prix next Sunday. The two-hour, 40-minute race will be televised on FS1 on a delayed basis beginning at 4 p.m. ET. The race will be carried live by IMSA Radio on IMSA.com, RadioLeMans.com and SiriusXM Radio.